This is a trial game I played using an adaptation of Mordheim for WHAA made by Mahon of Chest of colors and using my usual 10 mm. stuff. As I do not have ruined houses in that scale, the scenario will take place in the outskirts of Mordheim. My Orc warband is raiding a human territory. Both warbands cost fourteen combat points. The Orcs are a chieftain Rep 5 Hardiness 1, one shaman Rep 4 Hardiness 1, two Big 'Uns Rep 5 and four boyz Rep 4; all of them frenzy. The humans are an Averland mercenary group composed of one captain Rep 5 Hardiness 1, one sergeant Rep 4 Hardiness 1, four youngbloods Rep 2 with swords, two mountain guards Rep 4 with sword and pistol, two marksman Rep 3 with musket and one Halfling scout. 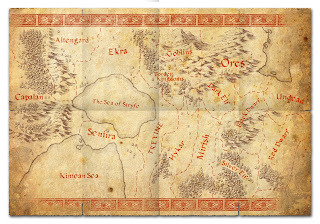 The Orcs split in two groups and enter on the East side and through the woods while the Averlanders are in the village, being most of them inside the houses. The Orcs from the bottom run towards the wall where a mountain guard is guard duty. He spots them and shoots but misses. The Orc boss and shaman together with two more boyz race through the ruins and woods towards the bridge. The Orc shaman spots the captain of the Averlanders next to the bridge and cast a spell of dread upon him, also affecting his sergeant near him. Orc boss and one boy reach the bridge but are counter charged but the captain and his sergeant and lock in melee. On the other side of the river the big 'uns and two boyz storm the wall dodging the bullets and kill the solitaire guard. Averlanders roll too high during several activations and cannot not get their troops out of the houses and help their captain, who panics and routs when his sergeant is slain in front of him. Without their two leaders, the Averlanders now will have it much more difficult to activate. The only Averlander with enough Rep comes out to help his captain but it is too late and he ends surrounded by Orcs and he is quickly dispatched. The Orc shaman tries to cast a new spell but suffers a backlash and gets dazzled. After killing the last of the mountain guards, the Orcs split in groups and register all the houses one by one, killing the leaderless Averlanders like trapped rats. The last to go is the Halfling who resists three consecutive melee round with the Orc boss. This causes a lot of fun among the greenskins. End of the game and time to see if any of my heroes get some advances. The Orc boss raises his Hardiness to two, keeps his Social Standing at five and gets a new skill: Silent Killer; but the shaman lowers his Rep to three and raises his Hardiness to two as well (this was surely due to the backlash he suffered after the first spell). The whole band searches for Wyrdstone and founds seven shards but three are spent in upkeep. WHAA is great to play solitaire so you can play a Mordheim campaign on your own and enjoy a lot. Also, this system allows hidden movement or fog of war, and reaction and counter reaction from both sides, so no one stays sitting duck. The only problem I notice here it is that the activation could unbalance the game. After his glorious debut and winning a Corona, the crowd demands the appearance of Spartacus in the arena. Batiatus, seeing an opportunity to regain his fortune, but not wishing to risk Spartacus unnecessarily, lends him for the execution of some prisoners of war. Spartacus demands to fight against two at the same time and Batiatus accepts on the condition he will forget his origins and embrace the Roman culture. To seal this agreement he is confronted against two of his country men, two captured Thracians. Spartacus is still Rep 5. Both Thracians are Rep 4, unarmoured and one equipped with a two handed axe and another with a throwing spear, dagger and small shield. Their names Axe and Spear. Once in range Spear throws his throwing spear and naturally misses ;-) After that Axe charges into melee, wins and hits Spartacus in the Upper Left Leg. Spartacus is wounded and burns 2d6 more. Now Spear draws his dagger while Axe attacks again, this time hitting Spartacus' Upper Right Leg. He receives no serious damage but is forced to give ground. Spartacus then returns the blow but it is parried. Axe keeps the pressure and trespasses Spartacus' defence once again, cutting his belly superficially and making him to give more ground and burn another extra d6. After that, Spear joins the melee and impacts with his dagger Spartacus' Lower Left Leg without further effect. Spartacus pauses to catch his breath. Now Spartacus fights against two opponents at the same time and cannot avoid being hit twice in his Left Arm and Lower Left Leg by his enemies. Fortunately his armour resists both strikes and he manages not to fall to the ground. It seems Gods do not favour Spartacus today. Spartacus desperately catches his breath again and then receives Spear's charge, wounding him in his Upper Left Leg. Spear falls to the ground face down and Spartacus jumps on him striking deep and killing him outright! Axe watches it while he catches some breath. Spartacus catches his breath again and signals Axe that he's waiting for him. Axe charges but he's parried. Now Spartacus slices through unarmoured Axe's Upper Left Leg, who falls to the ground and is spent out of dice. He is instantly finished off. The crowd cheers and roars. Although Spartacus had higher Rep he missed almost all his melee rounds and it was only his better armour which prevented him from certain death. Even so, he was injured and must rest for a month at least before entering the arena again. For this combat Spartacus has gained eight Advance points, which added to those from the previous encounter makes a total of thirteen AP. He needs 24 AP to raise his Rep to six. Motivated by the excellent TV serie Spartacus: Blood and Sand, I decided to run a small campaign using the rules Red Sand Blue Sky from Two Hour Wargames. Thus, I dusted off some gladiators forgotten somewhere in my place and painted them. As I did not have all the models I will use to run the full campaign I also ordered from EM4 the box Ludus Gladiatorius which includes an arena to play on and some pre painted models of decent quality that I needed. "uri, uinciri, uerberari, ferroque necari"
"To endure burning with fire, shackling with chains, to be whipped with rods and killed by steel"
With these words a Thracian slave gave his oath of submission to his new dominus, and became member of the brotherhood of Batiatus gladiators Schola in Capua. Because his Thracian origin he was given the Roman name of Spartacus, and trained and equipped to fight as a Thraex. Spartacus starts with Rep 5 and his ultimate goal is to survive and gain his rudis at the Colosseum. After months of due training he is introduced to his first gladiatorial fight. Both fighters hurry against each other. After the first fiery exchange of blows Spartacus is hit in his belly and forced to fall back, but fortunately his leather protection was enough to stop the cut. Then Spartacus returns the blow by hitting the Murmillo's helmet which saves him from certain death but does not impede him falling to the ground. Spartacus quickly takes advantage of such fortunate event and struck down with killing intentions, but the Murmillo revolves frantically and avoids it. He then desperately tries to stand up and fight off the wild Thracian but he falls down again. After fighting one more round from the ground the Murmillo gets exhausted and appeals for mercy. The crowd's opinion is split evenly and looks to the editor of the games to decide. The fight was quick, without blood being spilt and thus a bit disappointing. The editor finally makes the gesture that signifies death and the gladiator is killed immediately. Spartacus had done it pretty well in his first fight. He has won the match unscathed and with more than five dice in his pool, so he is granted a Corona. He has earned 5 Advance points and 50 Fame points. The whole fight took less than ten minutes. Einar and Fafnir finally reach the city of Gartenmeerstadt, at the very south of Altengard and in front of the Sea of Stryfe. Looking for a passage to Treyine they are told of a long boat with people from the north like them, which is expected in a few days; therefore they decide to stay in the inn of the Dry Anchor at the port, where those northmen use to go for a drink, and wait for them. In the meantime they get some rest and take the opportunity to recruit some more men to accompany them in their quest to the lands of the Dwarfs in the far East. As the word is spread that they are looking for men, a young and wild looking woman appears in the tavern. She presents herself as Tiku, an adventurer expert in the Two Heaven Sword Sisters Fighting School from Valkae. Lilu is a Valkae Rep 4 fighter and she is armed with two twin curved swords. Fafnir smiling like a horse, gives her a warm welcome before Einar can say a word. Later that night, a mature man with grey long hair and bear gently introduces himself a Rialto, magician and healer, and ask to accompany them in their journey for while. Rialto is equipped with his staff and a knife, his Rep yet undetermined. After two weeks of patient waiting, the long boat arrives, and soon a noisy group of tough looking men dash into the inn demanding some drinks. Einar shouts a scream of joy when he recognises the leader of these men as his cousin Egil. After a week of drinking, telling tales and causing trouble to the city, Einar and Egil reache an agreement. Egil will take Einar and his men in his boat to Treyine, and in return they will help Egil to raid the temple of Rania, the mermaid goddess of the Sea of Stryfe, where it is said their worshippers hold a huge treasure in silver. Thus they set sail to the temple of Rania in the north coast of Treyine. As they don't know well those shores, the ever vigilant monks of the temple spot the ship before they can avoid it. The surprise attack is now spoiled so they set direct course for the village whereas the alarm is sounded. Egil's men get angry as they see how all the cattle, women and valuable items are taken away towards the castle of the lord of these lands. But they get mad as they approach when they witness how all the men of the village, together with the monks from the temple, prepare themselves to fight them off. How they dare! Rialto, giving a step back, observes how Einar, Fafnir and even Tiku fall in this same mood, and how all the crew now starts to beat their shields with their swords and spears, and sing about blood and death. The village peasants lead by the monks await for them behind the walls and fences to gain some advantage in the melee, with some arches interspersed and ready to shoot as many arrows as possible before the inevitable clash. As soon as the drakkar prow reaches the sand, the northmen jump out and dash towards the village. Egil and most of his men on the left flank whereas Einar with his companions and a few Egil's men go for the right flank. Egil and his men charge like mad dogs towards the peasants, and so not giving them a chance to shoot their arrows; four of them and the monk who was leading them, fall in the first clash. Two more peasants rout horrified of the massacre and of these blood thirsty sea wolves. On the right flank Einar and his group does exactly the same and with similar results; although some peasants and one monk gather some courage to charge them, but only for the monk impaling himself into the spear of a north warrior. The defending villagers and monks from the temple are mercilessly slaughtered without the raiders suffering not even a single casualty. On the left flank Egil keeps pushing and reaches the second defending line, whereas in the right flank Tiku chases the last remaining peasants, as the rest head for the temple. Now there are only two remaining monks defending the only access to the temple, determined to stop the savages from the sea, and praying to Rania for their Lord to come in time to save the temple and kill the heretics. But the monks are quickly dispatched and the raiders enter the temple and start to loot it. -Get out of our way, old men! But suddenly the lord and his retinue arrive, and a cry of anger rises from the guards as they see all the villagers and monks slayed. The raiders quickly come out from the temple and run for their lives to the boat. Einar forms a shieldwall in the beach to allow the stragglers to reach safely. A spearman positions himself to stop the charge of the lord on his warhorse whereas the berserker hides in ambush behind the house. Meanwhile, Egil, Tiku, Rialto and many warriors run down the road as fast as they can. - To the boat, run! The lord has brought with him seven infantrymen and nineteen archers who quickly start to spread in a long line to shoot at Einar's shieldwall, whereas the lord and the infantry charge towards the stragglers. But the charge is stopped as the spearman manages to halt the charging knight, and Rialto casts a spell and puts fear into the hearts of all the infantrymen (Rialto's Rep is now revealed and is seven but is lowered down to Einar's Rep, which is five). The lord kills the berserker but the spearman holds the place. Some men from the shieldwall falls to the arrows while his mates keep runnning. -We cannot hold any longer, faster! The spearman finally dies and the knight and the infantry charge the raiders, whereas the archers release a final salvo of arrows. Some raiders fall but the majority holds. Now all depends on who activates first. Miraculously the raiders activate first and can leave the battlefield and flee in their boat, although they had to leave behind eight men, some of them still alive. The raiders didn't have time to get the treasure and lost eight men. Egil keeps his promise and brings Einar and his friends to a point of the north coast of Treyine, and then heads back to the Dry Anchor to lick up his wounds. Einar raised his Hardiness to four, but Fafnir lowered his Rep to four and Hardiness to two. Tiku also lowered her Rep to three but raised her Hardiness to two. Fafnir and Tiku didn't like much to run and leave their comrades at the hands of those bastards. Also Rialto raised his Rep to 6 and his Hardiness to two. One of the men of Egil (Rep 4) decided to go with Einar's group and he was given the magic bow they had gained in the last encounter. The group starts walking East, crossing Treyine and heading to Hykar, the land of the horse people.